Becoming Ariela: Day 8: A new day and new foods. Pain Level: 1 - A small part of my chin on my left hurt a bit this morning, but it's gone now... and everything else is just numb. Mood: Determined to get work done. I did a courageous thing yesterday night - I actually went out! I told myself I needed to get out and see the world even though I still totally looked like a potato head because I could feel depression setting in. I needed a "mission" though, so I decided that I should go get some fruits to blend into more nutritious meals. The trip to the supermarket was quite terrifying really because it was crowded. I was constantly afraid someone would point out something to their shopping buddy and say something like "look!" or "that way!" and swing their arms directly into my face. Yes, it was pretty irrational. But very probable. The incline and the vibrations of the travellator and the smell of the bleach from the cleaning of the floors at one part of the supermarket made me a little queasy. And honestly, I was so surprised how quickly my energy was drained from just a little walk around the supermarket. I was walking SO slowly I think everyone knew I was not exactly healthy, Well, the slow walking was telling, but that and my potato head face...I think it wasn't difficult to put two and two together. I was really self-conscious because I did see some people stare at me a bit, but it honestly wasn't that bad. Though I have to admit that I developed a deep empathy for people with a disease, and more so a visually obvious one, and the scrutiny they come under when they're in public. I remember a girl in my secondary school who had a disease that made her skin constantly dry and peeling. Her whole body (even her eyelids) was pink and covered in "scales" which were basically whitish dry skin. She was never in my class so I never really got the chance to talk to her, but I remembered feeling really sorry for her because of how much internal strength I imagined she needed to have to be out in public. People may not have wanted to sit with her on the bus because of the flaking skin, or the fear to catch the disease... there were so many reasons why people may have avoided her (mainly due to the lack of understanding and empathy), but yeah... that was my "growth moment" yesterday - developing a greater empathy for the sick. DO NOT. I repeat. DO NOT consume Maggi Instant Porridge if you're a jaw surgery patient. I only took 70mls of a blended watered down version of it yesterday and it completely left my tongue numb and tingling the whole day because of the MSG. Silly me. For dinner last night, I've begun drinking what my mum calls "porridge water" which is basically the liquid you get when you boil rice in water. It's supposed to be good for you...though I think the nutritional contents are basically starch and water. I did mix a tiny bit of Bovril into the water though just to boost the nutritional content a little. And washed that all down with as much water as I could because of the salt content. 4. Place soup in blender. Blend. 5. 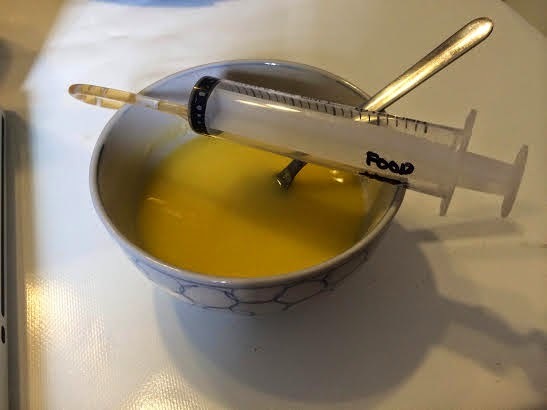 Strain soup to remove hard and large bits. 6. Put strained blended soup back on stove to boil. I could only manage something like 70mls of it but I was glad I got up to 70! (Small achievements! :)) The potato in it was a bit grainy which irritated my throat a little, but it tasted really healthy and good for me. And it was naturally sweet too. Notice I didn't put any salt in because I'm trying to control my salt intake. 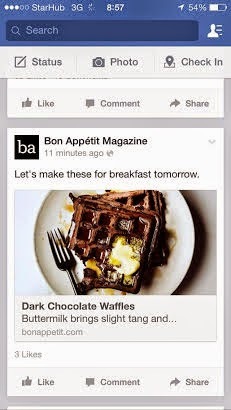 Other than that, I think my appetite is coming back a bit because I'm starting to get a bit sad when I see delicious things that I can't quite eat now.... like the Dark Chocolate Waffles that appeared on my FB feed. I did some research yesterday on some recipes for jaw surgery patients, but I just couldn't imagine blending and consuming a lot of the recipes presented - blended pizza, blended burgers, blended waffles.... it was almost sacrilegious for me to imagine blending a perfectly risen, toasted, crisp, fragrant waffle into a mush. It's an absolute insult to it! I will be patient. Today, I'm determined to get some work done... also cause there's a huge deadline today and Monday I need to meet. I need to will myself into it!